While most people involved with comic books remember the Wertham period of the 1950s and the resulting Kefauver hearings, the banning of Australian comics (also in the 1950s) and trials such as Disney v Air Pirates, not many remember the Nasty Tales obscenity trial that happened in England in the early 1970s. This is an enormous shame as it still stands as one of the most important trials for the comic book industry as a whole, as the content of the book was placed on trial as obscene with a very surprising result. 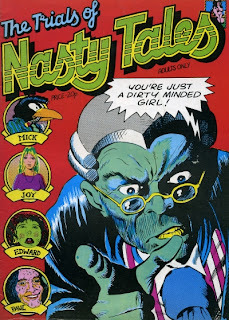 The trial revolved around the publication of an underground comic book named, naturally, Nasty Tales, but, at times, it seemed that, as with the OZ trials that preceded it, the entire UK counter-culture was on trial with a guilty verdict all but assured as the Establishment fought to keep the subversives of the time firmly in their place.